Remove lid by lifting upward. Pull towel from center of roll and thread through "X" on the underside of lid. Close lid. Pull towel at a 90° angle. Snap hinged cap back into place to ensure towels remain moist. 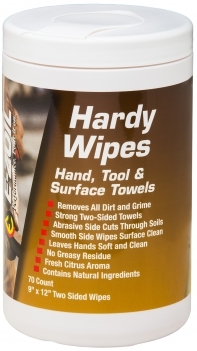 The best hand, tool and surface towel, HARDY WIPES use a high-performance formula to remove dirt, grime, grease, oil, tar and many other soils. HARDY WIPES are two-sided and can be used as a hand and tool cleaner or a surface wipe. For cleaning the toughest dirt and grime, reach for HARDY WIPES! E-ZOIL has a complete line of high-performance cleaning products to keep your vehicles, equipment, tools and hands looking great!